Learn how to change your flat tire! The noticeable clunking. The flashing TPS light. The stares of the drivers around us. We’ve all felt our stomach drop when we know we have a flat tire. So what happens when you’re in the middle of nowhere, out of cell phone reach and have no idea how to change a tire? Rest assured, we’ve put together a mini-guide to help you get back on the road in no time! Step 1: Make sure you’re safe. Pull over, put your warning lights on and light a flare or two if you have them. Step 3: Put something behind your tires that will remain grounded. This will make sure that the car doesn’t roll. Step 4: Put your car jack in place. Ensure that your jack is meeting the metal part of the car frame next to the tire that is flat. Step 5: Turn the lever on the jack until the car is supported, but not lifted. This will allow you to remove the tire easily while minimizing the risk of damage to your car or yourself. Step 6: Remove the hubcap and loosen the lug nuts that hold your tire on. Don’t remove them all the way just yet. Step 7: Use the jack to lift your car enough to see light between your tire and the ground. You’ll need to do this to make sure you’ll have enough room to switch out the tires. Step 8: Remove the lug nuts all the way and pull the tire off. This will allow you to make sure the tire is easy to pull off. Step 9: Replace the tire with your spare and tighten the lug nuts back on. Tighten the lug nuts as much as possible to secure the tire on. Step 10: Lower the car back down, remove the jack and take your car to a mechanic. They’ll get you setup with a new tire and tighten the lug nuts. 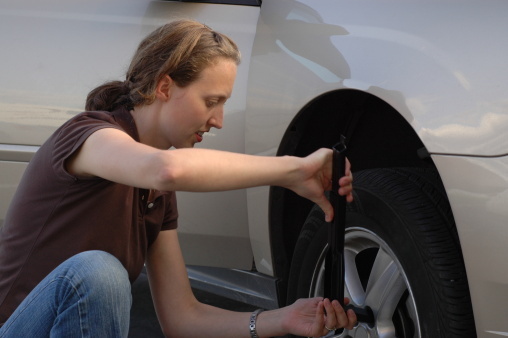 The mechanic will also be able to check to see if there was any more damage done to your car because of the flat tire. Drive safe!